What Is "Mirin" That Is Not Mirin? At present, what is called "mirin" does not refer only to "authentic mirin." During and after World War II when rice was running short, mirin made from rice was subjected to high alcohol tax as a luxury item. In order to evade the high alcohol tax, two types of mirin appeared. One was "New Mirin (Nikiri Mirin or mirin boiled up to remove alcohol)" made from cereals, and the other was "Salt Mirin" with alcohol fermented in salt water and with sweetness added later. These two types of mirin, not listed under the coverage of the Liquor Tax Act, began to be manufactured and sold. It was only somewhere in ten years from the mid 1950's to 1960's when authentic mirin, which had been used only at fancy Japanese-style restaurants and eel restaurants, began to be used at ordinary households, too. However, at grocery supermarkets having no license for selling liquors, as they were not qualified for selling authentic mirin, they sold only New Mirin and Salt Mirin. In 1975, the Japan Fair Trade Commission determined that all mirin items other than authentic mirin were unfit for mirin due to their contents, and categorized them as "mirin-like seasonings." Today, however, it is difficult to tell the difference between authentic mirin and mirin-like seasonings. Furthermore, it is now on the table that some seasonings added with salt should be named as "fermented mirin." This may make it more difficult to tell the taste of genuine "mirin" from similar lines. ／These two types of mirin are made by the Japanese traditional manufacturing method. High-quality glutinous rice, a raw material, is steamed in a Japanese-style oven. Prepared unrefined mirin is saccharified and matured for a long time. This is the original manufacturing method for mirin using spirit made by simple distillation process (rice spirit). It takes about two years to complete brewing and maturing. ／Steamed glutinous rice and rice malt are added with alcohol and thick malt syrup, and flavored with spices. It takes two to three months to complete manufacturing. Alcohol percentage is about 14%. ／Thick malt syrup and glucose sugar or starchy saccharified solution are mixed with chemical seasonings (mainly glutamine soda) and hydrolyzed vegetable protein essence. 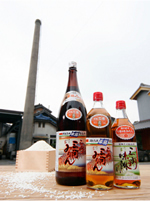 Available in the market are "Salt Mirin" made by adding carbohydrate solution to undiluted seasoning solution made by alcohol fermentation in salt water for adjustment, and "New Mirin, Nikiri Mirin (mirin boiled up to remove alcohol)" made by adding amino-acid and acidulant to carbohydrate solution made from cereals instead of rice. Practically no alcohol is contained.